A bridge and power plant would be kinda useless without an M-drive (and fuel and staterooms, etc). There's no reason why you couldn't use some of the 30 dtons to build something like that, but that would be a special module and not a regular one (which would dedicate the entire 30 dtons to cargo or whatever you wanted to do). The bridge controls lights / grav plates / atmosphere within the secondary hull as well as provides the controls for any other system within it. You can have a MODULE, which is a container that can be moved around. I think most of us understand what these are, freight cars, semi-truck trailers etc. They come in a variety of sizes. You need a bridge for flight controls. You don't need one for the lights and grav plates. There are things called switches you can put on walls... A bridge would be a huge waste of money for such simplistic needs. The only reason you would have a bridge is for flight. Rikki Tikki Traveler - You can have a MODULE, which is a container that can be moved around. I think most of us understand what these are, freight cars, semi-truck trailers etc. They come in a variety of sizes. In this particular instance Rikki-Tikki is referring to the modular cutter module. While it IS a container, it's also a highly specialized container that mates with the Modular cutter to form part of the ship. You are correct for most everything else, but just not here. But the GURPS modular cutter follows previous versions of the cutter, and it does NOT match the MGT version. Personally I prefer the modular cutter version from GURPS as I think its much more feasible and adaptable. The MGT version radically changes the idea, and for some variations it makes it impossible to use previous concepts because of how it is implemented. The previous design worked out rather well. The newer version doesn't make the same sense operationally due to how it is designed (if the design used clamshell doors to 'drop' the module out the bottom instead of the side it would work far better.) As it stands the illustrations show the module coming out of the side, which is awkward and damn difficult to handle in a gravity well when dropping off a module. Called dropping containers out of a cargo module, with the help of lifters or a crane. It also is less finicky with armour as its covered by the hulls armour. Classic modular cutter or MGT? Classic modular cutters modules do become part of the ship, as you can walk from flight deck to module going through a door, and then through another door to the engine compartment. Otherwise you'd have to access the rear by belly crawling through the spine access tube. I think that is too strict of a definition. Modular can mean that, or it can be more expansive. Depending on the design, a ship could be configured to be totally modular, and without the modules present it is nothing more than a simple frame (At the extreme of modularization). I would disagree - but only for this specific instance. The modular cutter (classic design) does not treat SOME of it's modules that way. There are modules that would fall within this category, but most do not. Most of the modules, when attached, create a single craft with only a very slight gap between the module and the cutter itself. They are like high-speed railsets where the separate cars are basically a part of an entire train and the passenger doesn't notice the engineering behind the scenes to make individual cars into one single flowing car. An external mount is different in operation and concept than the integrated module of the modular cutter. 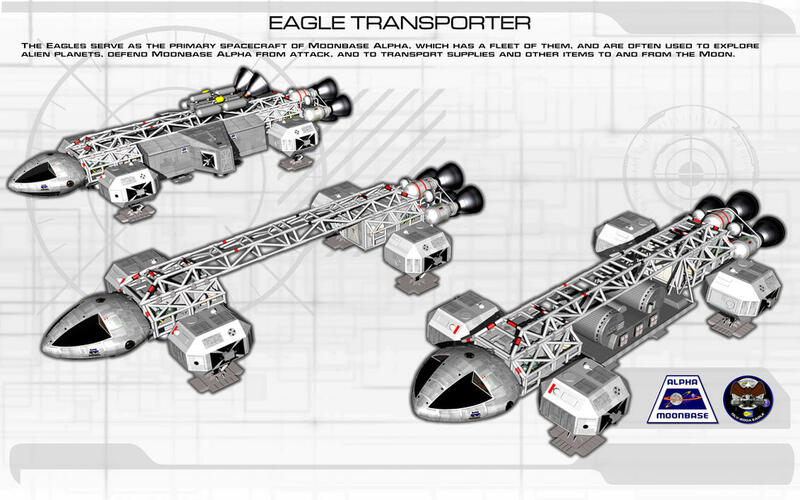 The Eagle from the Space 1999 series is also a good example of how combining the two creates something new (and essentially one) vehicle. Not really completely thought thoroughly through. And no post mortem errata. when attached, create a single craft with only a very slight gap between the module and the cutter itself. And yet the ship sans module can still function as a ship. They are like high-speed railsets where the separate cars are basically a part of an entire train and the passenger doesn't notice the engineering behind the scenes to make individual cars into one single flowing car. Not quite how that works, the engine / power section functions independently of the passenger / cargo cars. No, it's not quite the same. Ad I've repeatedly stated the modular cutters is an exception. The modular cutter is iconic in Traveller, possibly only the Suleiman class scout being more so. That gap being highly noticeable and memorable. Its based off the skycrane helicopter. We may need to distinguish between modules (perhaps more properly modal containers) which can be quickly and easily attached or detached and modules which are meant to be accessible from within the vessel. Attaching the latter may be more like docking a small craft as you have to ensure engagement of hatches, equalizing pressures, etc. It's thrown a wrench into the works of basic assumptions. Sky cranes were and those that still fly are awesome bits of flying engineering. But it's not quite the same. The modules for the sky crane were just meant to be slung underneath and fit between the landing gear. In fact I used that as the basis for my ground to orbit container carrier design. But modular cutters are still different. The module essentially becomes the reat of the ship when mounted. It's designed to become part of the ship when mated to it. I keep pointing out that it's a unique design. Your points are valid with the exception of applying them to modular cutters. The CH-54 slung it's container below, but it's not a conformal match like the modular cutter. Take a look at the CH-54 gallery here (https://www.militaryfactory.com/imagevi ... aft_id=715). There is an image of a Ch-54 in flight with a slung container below it. You can see that while it fits beneath it's clearly being carried as cargo and not as part of the helo. Another way to think of this is the F-15 conformal FAST conformal fuel packs which essentially become part of their aircraft. FAST packs allow for weapons mounting. The externally carried fuel pods do the same, but are as not efficient at doing so (increase drag and radar cross-section). While that's not an issue for a modular cutter, the standard carried pod retains the idea of it being part of the craft while attached. +1. we née like buttons. Point of trivia, Space 1999 was essentially a spinoff of the series UFO. I have always liked the Andersons work in models and thought processes. Anderson always tended towards gritty and realistic, at least hardware wise. His Eagles appeared to take their sweet time getting anywhere, so that solves the issue of aerodynamics and reentry.